Nevermore-my last Design Team post for Viva Las Vegastamps! This is my last post as a member of the Viva Las Vegastamps! Design Team. I’ve decided not to re-apply at this time to due various things happening in my life. I’m hoping things will be settled enough that I might try again the term after this one. So it is with some sadness I present my Nevermore card. Viva Las Vegastamps! images used. I chose Kromecote cardstock for it’s bright, glossy finish. I wanted to get the feeling of an eerie October’s moon gleaming through a peasoup fog. To start with I stamped all my images on scrap paper and cut them out to as masks, so I could stamp image over image..
Then I stamped the word ‘Nevermore’ and the moon image. 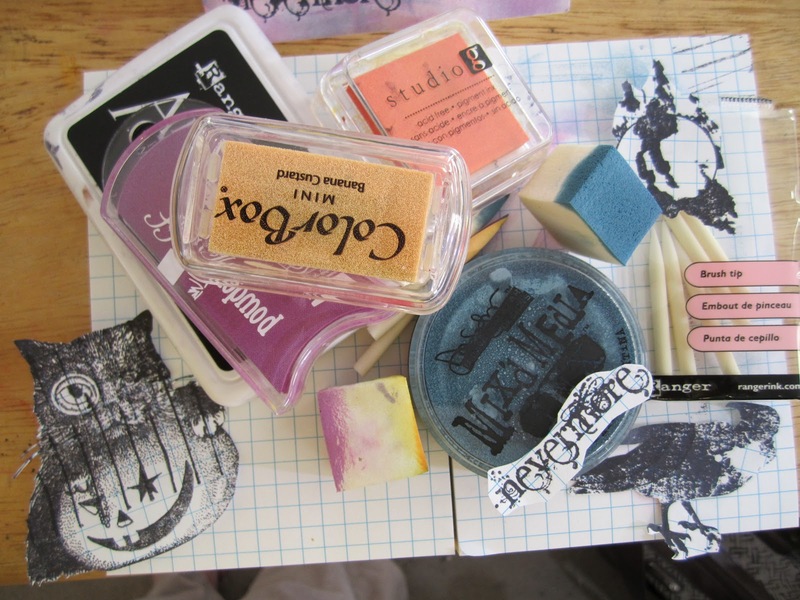 Since the Kromecote has a slick surface you need to be careful not to move your stamp when you apply the ink. The images come out beautifully-every detail just pops! I stamped the image of the Raven, and set the card aside to let the ink dry completely to the touch. 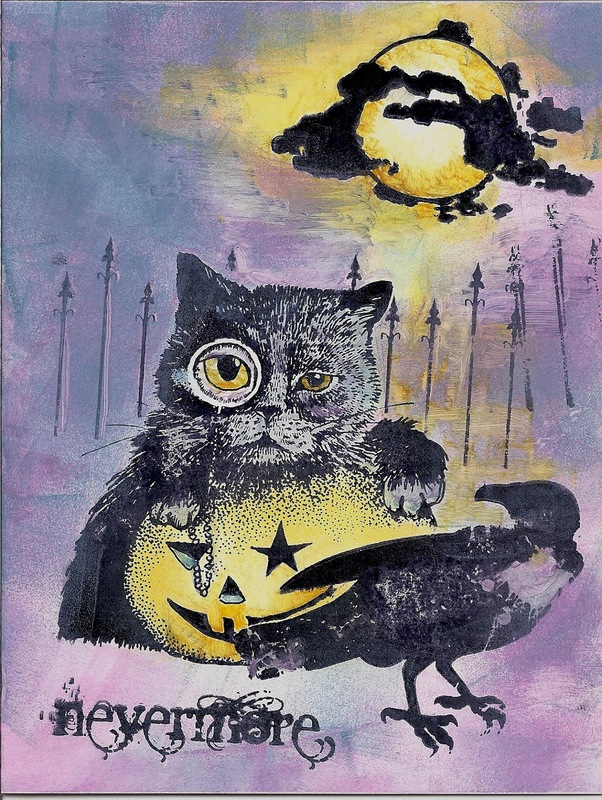 After the ink was dry, I placed the Raven mask over the Raven image, and stamped the Cat with the Monocle and Pumpkin. Again, I set the card aside. Once dry, I placed both the Raven and the Cat masks over their images, and stamped the Fence. I barely touched the stamp to the page because I wanted the fence to seem as though it were in the distance. I let the card sit overnight. I probably wouldn’t have had to wait that long, but I wanted to be certain there would be no smearing when I applied the color. I rubbed one of the brushtip sponges across the Banana Custard inkpad and colored in the moon, the cat’s eyes, and the pumpkin. Then I rubbed on some of the orange around the edges of both, then mixed Banana Custard and Orange on sponge and colored some of the sky. I used another brushtip to apply Very Berry and Patina to the Cat.. I switched the brushtip for a larger sponge, and apllied Very Berry all around the card. I lightly applied the color over the Fence and part of the Raven to increase the feel of fog swirling around, but I took care not to add too much. Then I applied the Patina blending it into the Very Berry, until the whole card was covered. Then I took a brushtip, and ran it along the side of each fence spike so that the Very Berry shone through–like reflections of light on metal. Chalking inks take a while to dry, especially on glossy stock, so I sat the card where it wouldn’t get smeared, waiting until it was fully cured before scanning it in. Despite the sentiment of Nevermore, I’ll be back with more Viva Las Vegastamps! project, Design Team or not! Meanwhile, check out the VLVS! Store for all your stamping needs and the VLVS! Blog for new projects and news every day. Follow VLVS! as the VLVS! Forum – VLVS! FB – VLVS! Pinterest – VLVS! Twitter. Next Post: The winner of my Daycraft Executive Diary Giveaway is….